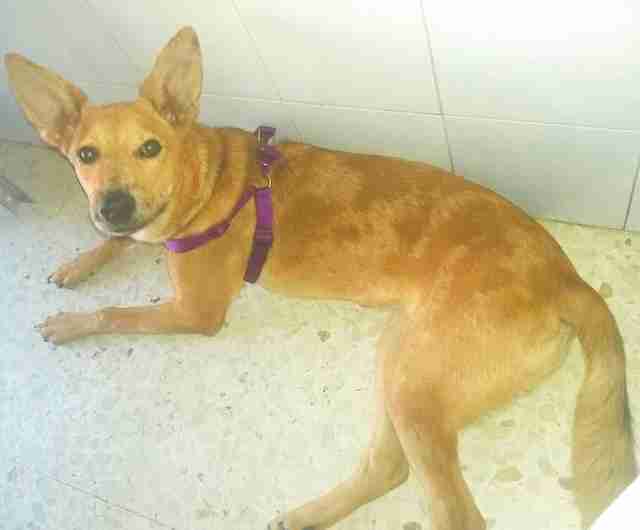 Maku Gonzalez volunteers for Podencos Y Mas, one of many dog rescue associations in Spain. 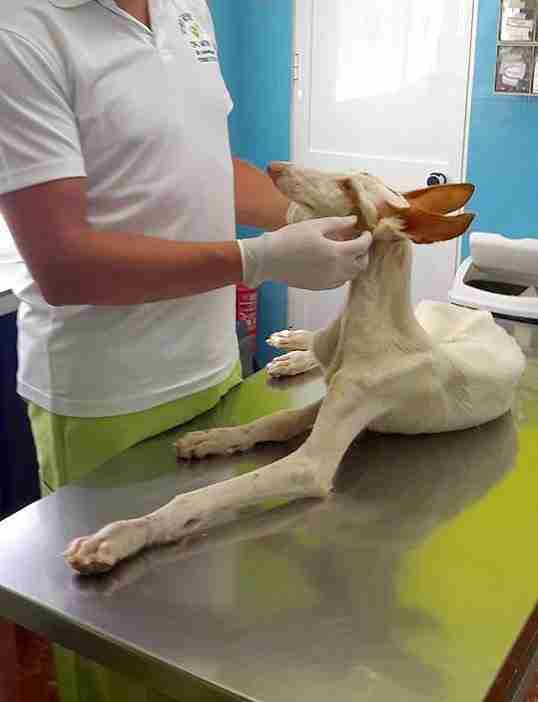 A few days ago, Maku found a beautiful white podenca (Spanish for "hound," though generally the term refers to the Spanish variety of Ibizan hounds), with red ears and big golden eyes, abandoned in the Spanish countryside, tied down, with both front legs broken. Podencos are bred and used as tools by Spanish hunters. 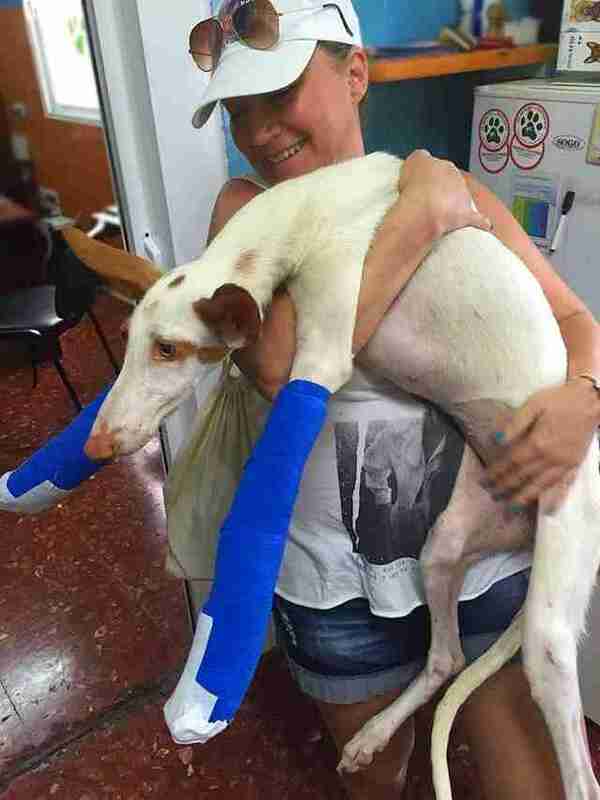 This - breaking the dog's legs and abandoning it far away from home so that it cannot find its way back - is one of many ways that the most unscrupulous of hunters dispose of their podencos when they find them no longer useful or good enough. You might expect such a dog to be impossible to approach, vicious, and even dangerous to touch. But no. 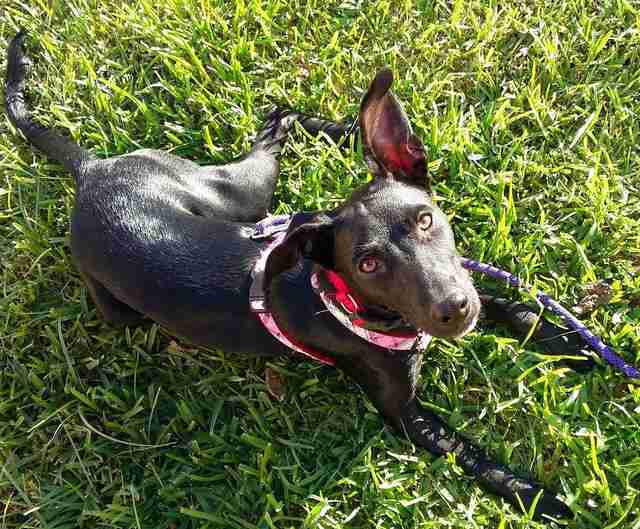 The podenco breed is not only loyal, but generally a gentle and sweet breed. Maku was able to easily lift and carry the dog, whom she named Sofi, away to rescue, where she would be examined, treated, and with luck, saved. 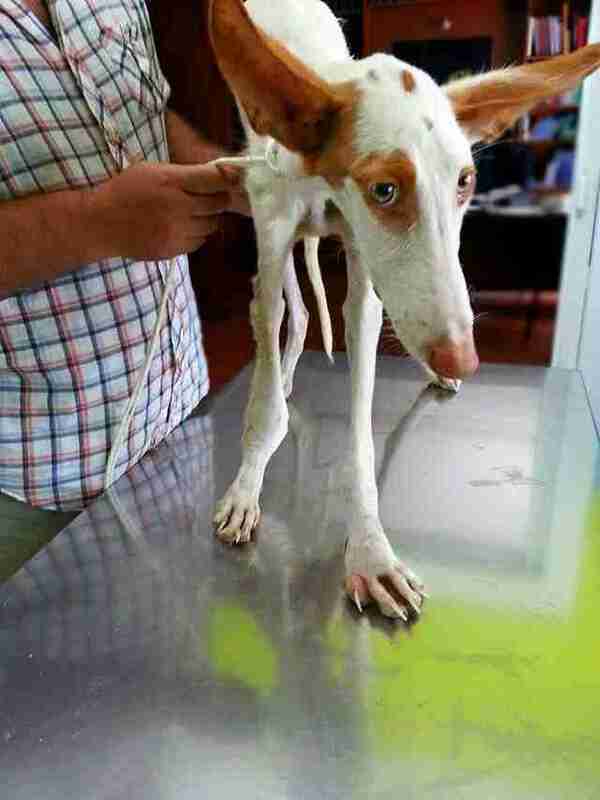 It is not uncommon for abandoned podencos to be found with one broken leg, typically a front leg. In my own rescue, we have had several over the last year or so. When these dogs are found broken-legged on the streets of Spain, it may be tempting for some to think they were "only" hit by a car. But logic dictates that being hit by a car would tend not to just break one leg, or even just two legs, and not always front legs. Some pro-hunter folks have argued that rescuers should not claim that the dogs' legs were broken on purpose or by their hunters since "the dog did not come with a sign around its neck saying 'My hunter broke my leg.'" Here I could spend a lot of time responding to the silliness of that argument, but no reasonable person needs me to respond to such absurdities. Sofi's vet appointments have been many so far and will be many more. Here we see a layperson's view of where the breaks are. Sofi gets an overall exam, demonstrating again her incredibly sweet and tolerant nature. Here we see hints of what she's been through in her eyes. Having two legs broken, then repaired and casted, of course is going to be traumatic on any sentient being. Add to that the sudden strangers and strange environment - she's handling it all like a superhero. But none of these people are truly a stranger to Sofi now, and Maku is there with her for every step of her treatment. 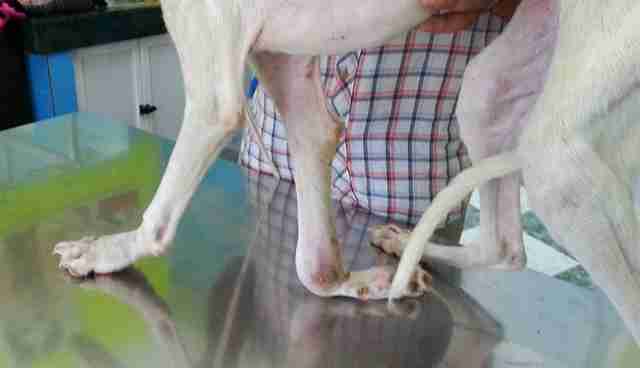 There is much to overcome - not only the two broken legs, but a host of other issues have also shown up in her symptoms and tests. These dogs, even when doing a great job for their hunters, live outside, typically chained in shacks or other terrible conditions, vulnerable to myriad diseases. Sofi may have more than one. 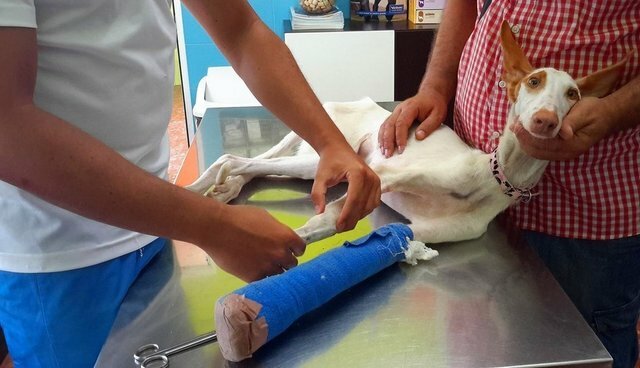 Podencos Y Mas, with the devotion of Maku Gonzalez and veterinarians, will continue to work tirelessly to help Sofi to what they hope will be a full recovery. It is little by little and not certain yet, but we all have hope, and great respect for what they are doing. If you are considering an adoption, please check out all of the Podencos Y Mas dogs. They all need you. Check out PYM's facebook page. If you are in the US and want to know more about the plight of podencos and galgos and how you can help them, contact us via email at welcometothesea@comcast.net or visit our website www.houndsanctuary.org.